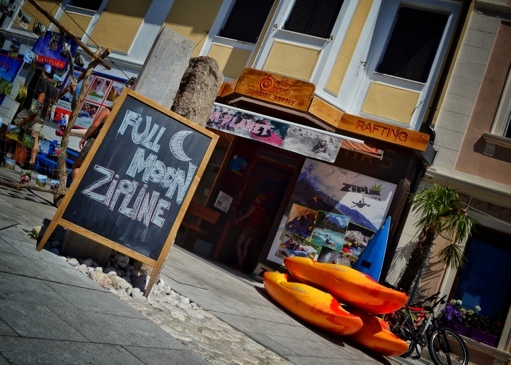 After a 2 hour splash down the icy cold Soča with Sara and the crew from Activni Planet rafting we are standing in the sun trying to warm our extremities and grinning ear to ear. Day One in the Soča Valley and we couldn’t be happier. 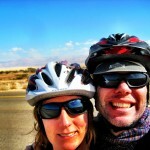 Bright sunshine on our faces, turquoise blue river at our feet and giant Alps towering above our heads. 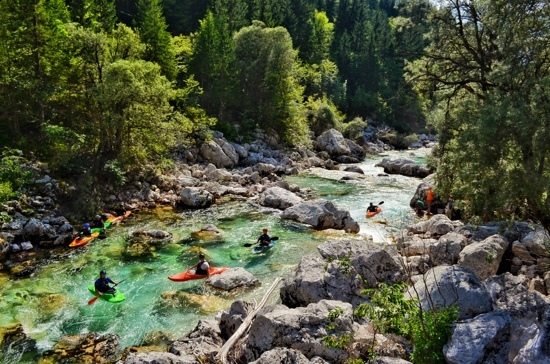 It’s easy to see why everyone has told us that Soča is the gem of Slovenia. 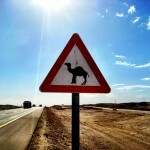 In a country whose entire persona surrounds outdoor activity; cycling, mountaineering, hiking etc…. that is really saying something. The Soča lives up to its billing. The next morning we meet with up with Activni Planet gang again. This time they’ve arranged a canyoning trip to one of the nearby tributaries. After an hour hike up the gorge, along a trail that would make a pack mule weak kneed, we plunge into another icy cold stream. This time there’s no raft. Only our guide, Marko with his arsenal of ropes, and our own wits. After the appropriate cool down period, we start down stream. The gradient is around 200 meters per km. Sometimes it comes all at once, as in leaping from a ledge into the stream below. Sometimes it’s a gentle limestone slide into a deep blue pool. Slipping, splashing and wading our way back down to the valley, we almost forget that we’re here on a bicycle adventure. Part rappelling, part swimming, and little bit of caving; Canyoning will do that. It demands your full attention. This is emphatically illustrated at the last drop. A 15 meter vertical rappel into a shallow pool below. Marko asks for a volunteer to go first. Somehow I’m selected since I speak English and I can advise the following victims, er, clients where to proceed after splashdown. Minutes later we’re all safely gathered at the base of the valley, brimming with that familiar endorphin rush that comes from being soaked, mildly scared and standing in the sun surrounded by an unbelievably beautiful natural setting. This is the good stuff. 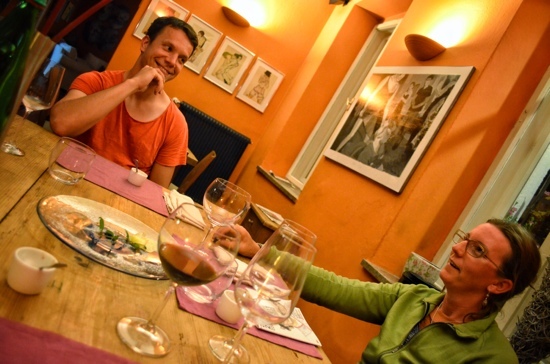 In the evening, we are the first guests ever at Hostel Bovec, a new venture just steps from the center of town. The hosts Samo and Sanel who also run Hostel Histria in Koper, and have offered to let us be the test pilots for their Alpine endeavor. Comfy beds and clean sheets. What’s not to like? In the morning they insist on treating us to breakfast and then loading our bags with extra croissant and bread as we leave. We love the Slovenian hospitality. Thanks guys! See you in Koper. 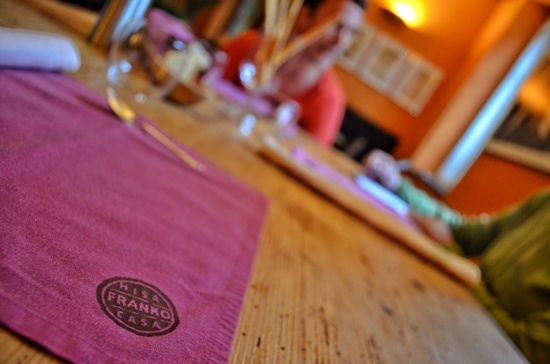 Within minutes we’re surrounded with pairings of wine and tapas style dishes which arrive at a frenzied pace. Valter, the proprietor, stops by the table to chat and “test” the wines. He tells us about growing up in this restaurant when his parents ran it. Sleeping on the floor in front of the fireplace, while his parents cleaned after the doors closed. Now he and his wife, Ana – the chef, run it with their children spending day and night here. Their passion and commitment show in every detail. When I complement him on his attention to detail, he shrugs it off. “This is just what we do…” I suspect this is indeed just what he does. And just what he does is excellence, no matter the medium. Valter strikes you as a guy who, if he chose to make shoes, would make the finest shoes ever worn. Instead he has chosen to make a dining experience that is both extraordinary and casual all at once. 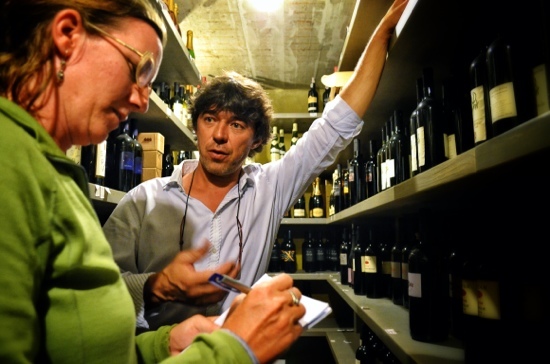 After about an hour of wine and small plates Valter invites us to see the wine cellar and the cheese storage. This is important stuff. In these parts they take both wine and cheese seriously. We venture though the back of the building to the subterranean storage area. Some cheeses are aged here several years. Others are eaten as “young” cheese. In addition to the cheese there are dozens of jars of home canned tomatoes from the garden above our heads along with local made salami and sausages hanging from the ceiling. Next door there are hundreds of wines from vineyards all around Slovenia. 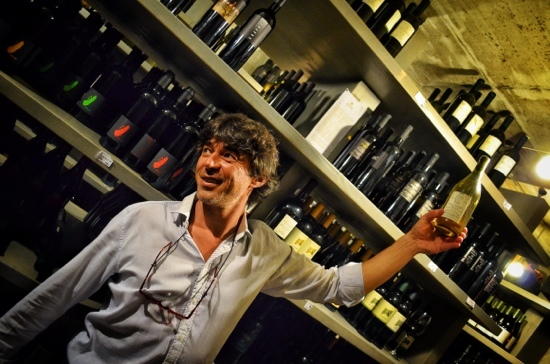 Valter not only knows them all, he knows the story behind the wines and the winemakers as well. In the morning we will begin the long uphill push to the ridges above the Soča, stopping briefly at the open air museum paying tribute to fallen soldiers and then the descent into Goriška Brda, or ‘Slovenian Tuscany’. Daks has plotted a route for us that tops Kolovrat the site of fierce mountaintop fighting between Italy and then Austro-Hungarian forces in WWI. We will need our rest since the initial ascent is around 850 meters. After which, he assures us, there will be 40km of slow descent into Goriška Brda. It is precisely this is the transition, both physical and cultural, from alpine valley to verdant wine lands, that makes this Slovenia so special. There are significantly stunning landscapes, almost completely opposite in nature, just next to each other. Divided by only a short distance. 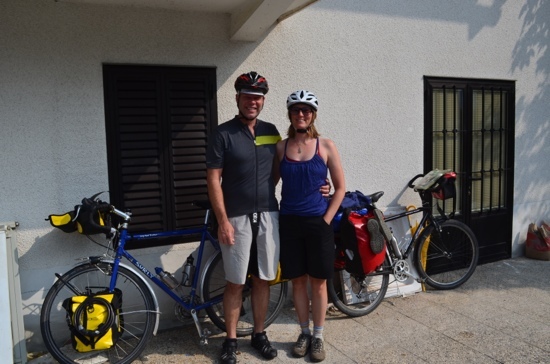 In this case within a one day bike trip we can go from towering limestone peaks and clear cold mountain rivers to low rolling hills covered in family owned wineries, all bathed in golden mediterranean sunshine as far as we can see. This has been a familiar theme all across this tiny remarkable country. Finding one charming place no more than 60 km from the last, seemingly different, yet equally charming place. This is exactly why we think Slovenia is the best bike travel destination in Europe. Goriška Brda here we come. That river looks amazing! 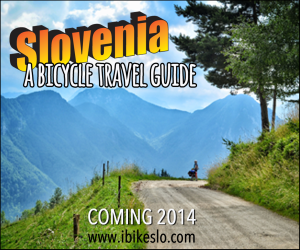 Slovenia looks like an awesome place to cycle, I hope I’ll be able to visit it some day with my bike! One thing I sometimes dislike about cycle touring + camping is that we can never really leave our stuff alone and do non-biking activities! In a cheaper country like Slovenia, I guess staying in a cheap hotel is a possibility and we would be able to do other stuff 🙂 Looking forward to hearing more about your travels in Eastern Europe! Slovenia is an amazing place to travel by bike. The terrain and the people are wonderful. Actually it is one of the safest places in Europe. At first we were overly cautious about our things. But, really even at a campground they were always safe. The camp hosts at small camps know who is who…tht being said, it’s always wise to minimize “exposure”. We have all our irreplacables with us or secured at all times..
Hope you get to travel Slovenia soon. 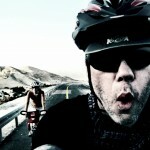 I love your articles about cycling in Slovenia. You write about all the reasons it is worth to visit Slovenia. And your photos are beautiful. Thanks for the kind words. Please contact us thru our contact page with a phone # or email address and we can discuss.